Dungeness Spit on the Strait of Juan de Fuca near Sequim remains a hot spot for the invasive European green crab, which first showed up in Puget Sound during the fall of 2016. This small male crab is one of the European green crabs caught last year in traps at Dungeness Spit. The green crab, one of the most dreaded invasive species in the world, brings with it the potential to destroy shellfish beds and disrupt key habitats essential to native species in Puget Sound. Thankfully, except for the Dungeness Spit, new findings of green crabs have been almost zero since a massive volunteer trapping effort resumed in April throughout most of Puget Sound. Nearly 100 invasive European green crabs were trapped along Dungeness Spit near Sequim this past spring and summer — far more than anywhere else in Puget Sound since the dangerous invaders first showed up last year. European green crabs started showing up in traps on Dungeness Spit in April. Despite the large number of crabs found in this one location, green crab experts remain undeterred in their effort to trap as many of the crabs as they can. And they still believe it is possible to keep the invasion under control. 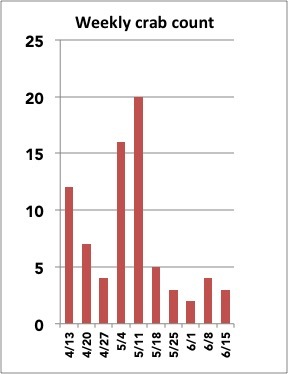 After the first green crabs were found on Dungeness Spit in April, the numbers appeared to be tapering off by June, as I described using a graph in Water Ways on June 24. The numbers stayed relatively low, with three caught in July, two in August, three in September and two in October. But they never stopped coming. The total so far at Dungeness Spit is 96 crabs, and more can be expected when trapping resumes next spring. The good news is that all the crabs caught so far appear to be just one or two years old — suggesting that they likely arrived as free-floating larvae. That doesn’t mean the crabs aren’t mating at Dungeness Spit, but the trapping effort has reduced the population to the point that males and females are probably having a tough time finding each other. Officials with the U.S. Fish and Wildlife Service, which has taken charge of trapping at Dungeness Spit, will need to decide whether to attempt a complete eradication of the local green crab population, according to Allen Pleus, coordinator of Washington State’s Aquatic Invasive Species Program. That would involve managing a large number of traps until no more crabs are seen. The alternative, he said, would be to manage the crab population with fewer traps and make further decisions down the line. During one three-day stretch last year, 126 traps were deployed in areas on and near Dungeness Spit, part of the Dungeness National Wildlife Refuge managed by the Fish and Wildlife Service. Even with the most exhaustive trapping program, there is no guarantee that green crabs won’t be found again, Allen said. The likely source of the crab larvae is an established population of green crabs in Sooke Inlet on Vancouver Island, just across the Strait of Juan de Fuca from Dungeness Spit. Allen said he is disappointed that crabs continued to be caught on or near Dungeness Spit — mainly in one small area near the connected Graveyard Spit. “But I am very impressed with the dedication of the U.S. Fish and Wildlife Service, which continued to trap throughout the summer,” he said. While there is no evidence so far that the invading crabs have reproduced at Dungeness Spit, it is possible that mating took place. If so, everyone involved in the green crab effort could face a whole new group of young crabs next year. I have to admit that I was worried last spring that funding for the essential volunteer effort would run out as officials scrambled to finance the start of trapping season. But the Environmental Protection Agency agreed to fund the project through next year under the Marine and Nearshore Grant Program. Meanwhile, Allen said he is working with Canadian officials to see what can be done about reducing the population of green crabs in Sooke Inlet, which is likely to remain a source of the invasive crabs coming into Washington state. The Canadians have their own concerns about green crabs, which can severely damage commercial shellfish operations and disrupt critical eelgrass habitats. Canadian officials are monitoring for green crabs on their side of the border, but the effort is much less than in Puget Sound. It appears that only limited efforts have been made so far to control the Sooke Inlet population and reduce the amount of invasive crab larvae heading to other areas in the Salish Sea. Researchers are still investigating the conditions that allow green crab larvae to survive long enough to grow into adult crabs. It appears that larvae move up the coast from California during warm years and particularly during El Niño periods, Emily told me. That may explain why the Puget Sound traps began catching so many crabs the past two summers. That could offer renewed hope for the immediate future, since El Niño is over and we may be going into cooler La Niña conditions next year. No new crabs have shown up in the San Juan Islands, where Puget Sound’s first green crab was discovered last year. But two more were found about 30 miles away in Padilla Bay, where four crabs were caught last fall. New areas with green crabs this year are Lagoon Point on Whidbey Island, where two crabs were caught, and Sequim Bay, not far from Dungeness Spit, where one crab was caught. The latest concern over green crabs is Makah Bay on the outer coast of Washington near the northwest tip of the Olympic Peninsula. In August, a beach walker spotted a single green crab on the Makah Tribe’s reservation and sent a picture to the Puget Sound Crab Team, which confirmed the finding. Tribal officials launched a three-day trapping effort last month and caught 34 crabs — 22 males and 12 females — in 79 traps. Emily said she is most proud of all the people and organizations that have come together as partners to quickly locate the invasive crabs and advance the science around the issue. Such cooperation, she said, makes the impact of the program much greater than it would be otherwise. Are we at a crossroads in the green crab invasion on Dungeness Spit? State biologists are holding out hope that the European green crab invasion at Dungeness Spit can be contained. We may now be going through a critical period, which could result in a permanent infestation or possibly the final throes of the invasion. 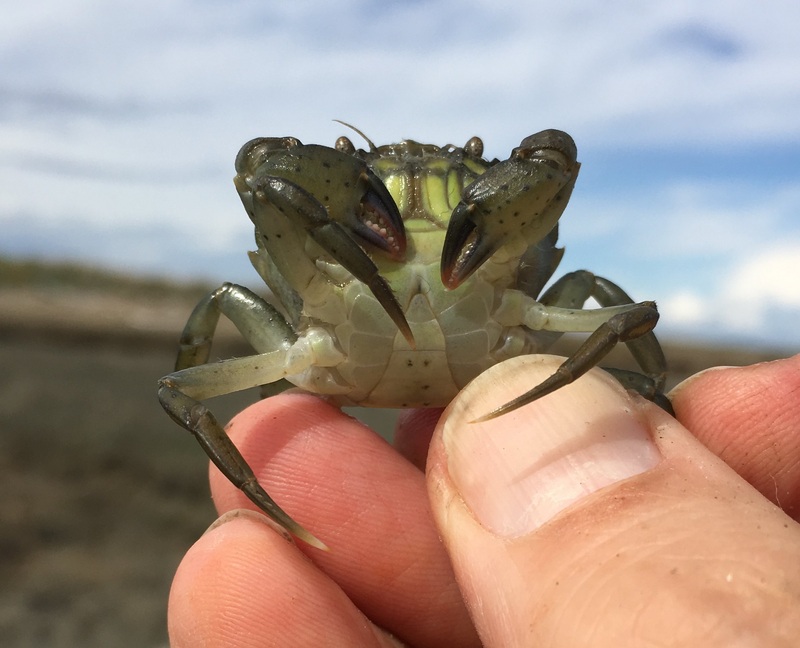 Green crabs, an invasive species known to displace native species and cause economic devastation to shellfish growers, were first discovered on April 12 in a marshy area on Graveyard Spit, which juts off from the larger Dungeness Spit in the Strait of Juan de Fuca. The total number of green crabs caught in an ongoing intensive trapping program has reached 76. The weekly numbers have been declining, as shown in a chart on this page. That could be a good sign, but biologists are quite reserved in their predictions. So far, all of the crabs caught are young and small — about 1 to 2.5 inches across their backs. This means that they have not been in the area for long, probably arriving on last year’s currents in the Strait of Juan de Fuca. Another good sign is that no other crabs have been caught elsewhere along the Strait, although officials acknowledge that they would like to deploy more traps to capture any early invaders. Also, I am happy to report that no new crabs have been captured this year in Padilla Bay or on San Juan Island, where the state’s first confirmed green crab invasion took place last year. See Water Ways, Sept. 24, 2016. Update: I’ve been informed that one green crab was caught in April in Padilla Bay where others were caught last year. The decline in captures at Dungeness Spit may be a sign that some of the crabs have entered their reproductive phase, a period when they don’t eat and so are not attracted to the baited traps. Males and females get together to mate after molting, a phase of development in which they shed their exoskeletons. The trapping effort has reduced the crab numbers and made it more difficult for reproductive males and females to find each other, but each female can produce hundreds of thousands of eggs — so even one successful mating could expand the invasion. Because the baited traps may not work at this time, officials are experimenting with substrate traps, which are pieces of plastic pipe ranging in size from a half-inch to 2 inches, Allen told me. Young crabs may seek shelter in the tubes. So far, no crabs have been captured that way. Another idea yet to be tried is baiting traps with pheromones, which are sexual attractants that lure crabs looking for a mate. Allen said he also would like to experiment with electrical stimulation, in which an electrical current is discharged in the muddy substrate to drive crabs out of their burrows. With proper control, no permanent harm comes to them or other creatures in the vicinity, Allen said. When it comes to controlling future crab invasions in Puget Sound, experts would like to know where the crab larvae are coming from. The leading suspect is a population of green crabs that appear to have settled into Sooke Inlet, just west of Victoria on Vancouver Island in Canada. It is also possible that the larvae drifted in from coastal waters in British Columbia, Washington or even Oregon or California. Experts hope that genetic tests of green crabs from the various locations can be used to identify where the crabs on Dungeness Spit originated. Emily Grason of Washington Sea Grant coordinates a group of volunteers who monitor traps placed throughout Puget Sound with a goal of stopping the next invasion. “The presence of green crab in Dungeness Bay, though unfortunate, offers a unique opportunity to test how effective the EDRR (Early Detection-Rapid Response) model is for intervening in a potential green crab invasion,” Emily wrote yesterday in a blog post on the Crab Team website. “Generally speaking, invasive species are rarely noticed in a new spot until they have already become too abundant to eradicate,” she said. “Though 76 crabs at Dungeness Spit is more than we would ever like to see, the population hasn’t yet reached the numbers that are seen in areas of greatest infestation. And they are, as far as we know, still confined to a relatively small location…. Emily added that we are fortunate in this area to have the tremendous support of volunteers, partners and beachgoers, all involved in the effort to prevent a permanent invasion of green crabs. Staff and volunteers at the Dungeness National Wildlife Refuge have been instrumental in placing and tending the traps placed in that area. An invasion of the European green crab, which started last summer in northern Puget Sound, appears to be continuing this spring with 16 green crabs caught in traps at one location on Dungeness Spit near Sequim. The new findings are not entirely unexpected, given that invasive green crabs have established a viable population in Sooke Inlet at the southern end of Vancouver Island in Canada. From there, young crab larvae can move with the currents until they settle and grow into adult crabs. 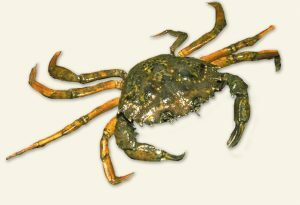 Last summer and fall, green crabs were found on San Juan Island and in Padilla Bay. The big concern now is that a growing population of invasive crabs could spread quickly to other parts of Puget Sound, causing damage to commercial shellfish beds and disrupting the Puget Sound ecosystem.